DAVID KUKLIS love of science fiction and fantasy began at an early age, when he and his brother, inspired by the game Dungeons and DragonsTM, staged similar games in their backyard and nearby woods. His uncle, a marine paralyzed from the neck down in Vietnam, usually ran the indoor games around the table, and his father was the inspiration for Twiggy, a major character in this book. Escape from Netherworld is an epic fantasy work by author David Kuklis. The action centers on seven friends who enjoy a Dungeons and Dragons style role play game. Leading the pack are brothers Joe and Dave, who set off in full costume to conduct their latest game in a cave, where Dave has a romantic surprise in store for his best girl Kerri after the game. But the end of the game never arrives, as strange and supernatural circumstances transform the seven players, hurtling them into the very world they have always imagined entering. Here they become the characters for real and encounter all the wonders and dangers of epic fantasy game play for themselves. Fans of RPG table games are sure to be sucked into the vivid description, technical details and plentiful in-references of Escape from Netherworld. There’s more than a hint of autobiographical influence from author David Kuklis who has clearly based plenty of the action on his own experiences, but I particularly enjoyed his balance of action, romance, humour and rather high-concept fantasy as the novel rolled along. It is also interesting to see the inner workings of the minds of RPG fans, in this case how the characters are actually tempted to stay in the fantasy realm rather than return to real life. 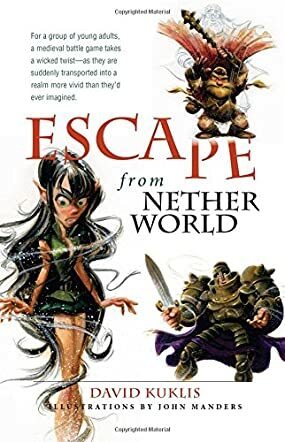 Overall, I’d say that young adult and college age readers are sure to enjoy the twists and turns of the story, and older fans of D&D and similar games will likewise find Escape from Netherworld a compelling read. Fun and fantastical…those are the two words I would use to describe David Kuklis’ new work, Escape from Netherworld. In this fast-paced, thrilling page turner, seven Dungeons and Dragons playing friends enter an alternative dimension, one in which the roles they play in real life become their real identities. The seven friends - Joe, Dave, Kerri, John, Nora, Mike and Vince - find they have to band together and use all of the skills their characters held to protect themselves and each other from ogres and orcs and, eventually, to do battle with the wizard determined to keep them in this new realm. During their journey, they befriend druids, elves, dwarves and humans with magical abilities, all of whom they need to call upon to help them on their quest to return home. Any lover of role-playing games would love this book. I think most young adults would enjoy it, even if they haven’t played RPGs before, as it is so inventive and easy to read. Most of us have imagined what it would be like if we could truly enter into the worlds we imagine when we play a role, and this book is definitely a manifestation of that. David Kuklis’ Escape from Netherworld is action-packed, adventurous and exciting, and it’s a book that you won’t be able to put down once you start it. The greater themes of friendship, bravery and protecting those you love also shine through, and provide a meaningful thread throughout the storyline. I loved the cover and the drawings within the novel itself. I would have loved to see even more artwork throughout the book. Good work, Mr. Kuklis, and I look forward to reading more from you! Escape from Netherworld is a fast paced action novel based around a group of friends who are weekend war gamers. One weekend, things get strangely out of hand and the friends find themselves fighting for their very survival in a world similar to one of those in their games. Escape from Netherworld is so obviously a creation of love on the part of David Kuklis. The characters are right out of his gaming world. His deceased father is the inspiration for Twiggy, the spunky, hammer throwing dwarf. I imagine other characters in Escape from Netherworld have counterparts in the real world. That's because David Kuklis writes about them like he is writing about old friends. It is very obvious that David knows the people, realms, and scenarios from Escape from Netherworld very well, and avid gamers will enjoy this game fantasy adventure. There is something a little more interesting about a fantasy novel where the main characters come from our own world. We can understand and relate to their actions and feelings in their strange new environment a little better. We can sympathize with their urgent desire to get back home, as well as the impulse to help and do good in this new environment. David Kuklis uses all these elements in Escape from Netherworld in order to create a novel gaming enthusiasts and young readers of adventure fantasy will love. The story moves swiftly from one obstacle to the next, as it heads to a dramatic, action-packed conclusion. A good light read for young fantasy fans. Escape from Netherworld by David Kuklis is a fun little romp of a read. It starts out with a group of LARPers out for a weekend of play in a series of caves. A bit of a shakeup lands the group in another realm, where they've become their gaming characters. What follows is a chance for the characters to find their true mettle, and explore a world with true magick and real monsters as they seek a way home. Once in 'game mode' and throughout the rest of the novel, the characters' LARP names are used instead of their 'real world' names. This certainly helped establish the feel of the realm in which the gamers find themselves. I love the book cover! I know one shouldn't judge a book by the cover, but let's face it - people do. This cover was what first attracted my attention, followed by the title. I'm glad I gave it a chance. I imagine the author would make a great DM. There were only two slight downsides for me, which are entirely subjective. I found the sparse use of contractions to be a bit dissonant and formal sounding. There are also a few places where the transition between groups of characters in differing locations is not as clearly delineated as may be wished. However, Kuklis' Escape from Netherworld is sure to please fans of Dungeons and Dragons. Indeed, the book has the feel of the novels set in the realms of Dragonlance and Forgotten Realms. I also found the story vaguely reminiscent of the .hack franchise, at least in terms of game players becoming their characters. Different premise, I know, but a similar feel to me. In Escape from Netherworld by David Kuklis, seven friends had gathered in the caves for their monthly battle games; a thrilling get-together that they always looked forward to. However, this time they were in for a real treat. Just as the games started, the ground gave away and the group was swallowed up, waking up in a strange place. But what was even more exciting, and scary too, was that they were not just dressed in their pretend battle costumes any more, but had been transformed into those characters. Suddenly the group was living its fantasy; real characters, real weapons, real magic, real medieval times, and real battles. But could the reality of it all be too much for them to handle? The group immediately set about learning about this new place and why they had been sent there, but first they will have to take on endless enemies as they defend their new found allies. Join the adventure as the friends defend the people of Thalus and desperately search for a way back home as new allegiances are formed and old ones tested. Escape from Netherworld by David Kuklis is a thrilling blend of action, adventure, sci-fi, fantasy, drama and romance set in medieval times. David Kuklis built a setting that is unique and yet feels very real. The story comes to life through a compelling setting, memorable characters, and flawless writing. The thrill of the action and incredible character transformation is kept alive throughout the story. Each scene is wildly vivid, original and different from the last, keeping the story fresh and thrilling all the way to the very end. Escape from Netherworld is an adrenaline-pumping page-turner that cuts across genres and is guaranteed to give readers a dazzling thrill.